Councilwoman Wendy Culbreath, left, is shown reading a letter from state auditors on Monday at Hillsboro City Council’s April meeting. Also shown, left to right, are councilmen Brandon Leeth and Adam Wilkin. Discussion grew heated Monday night when members of Hillsboro City Council and Mayor Drew Hastings criticized Auditor Gary Lewis for allegedly not fulfilling some council members’ requests for more detailed financial reports. As previously reported, council in December approved legislation that compels the city treasurer to provide detailed monthly finance reports to council. Council members said Lewis would be charged with the task since the auditor’s office completes many of the treasurer’s statutory duties. The motion carried 4-3 with Wendy Culbreath, Ann Morris, Claudia Klein and Mary Stanforth in favor, and Justin Harsha, Adam Wilkin and Brandon Leeth against. On Monday, it was Culbreath, Klein and Morris who complained that Lewis had not supplied the requested reports. Lewis was not in attendance Monday night. He did not immediately respond to a call and voicemail requesting comment. When Culbreath asked Council President Pro Tempore Justin Harsha what the status of the reports was, Harsha said Lewis had a “very big report,” but needed council members to narrow down their request. The councilwomen expressed frustration about not receiving specific reports they said they have been requesting for almost two years. Culbreath also read a letter from state auditors saying Lewis should provide more detailed information to council than the reports he already supplies. Harsha suggested that council members formally request Lewis’ presence at meetings, and Klein did so, citing a law that requires city auditors to appear at council meetings if their presence is requested. Also Monday, council voted 6-1 on a third and final reading of an ordinance adding a $3 surcharge to residents’ water bills. Culbreath was the lone “no” vote. In other business, Hillsboro Mayor Drew Hastings said in his report that the city may have some type of agreement with the owner of the Parker House and surrounding properties this week. As previously reported, the sidewalk and a portion of the street near the property have been blocked off due to falling debris. Hastings later requested an executive session to discuss property, and Harsha said there was no need. Council also approved legislation moving $100,000 from contingency funds to blighted property. 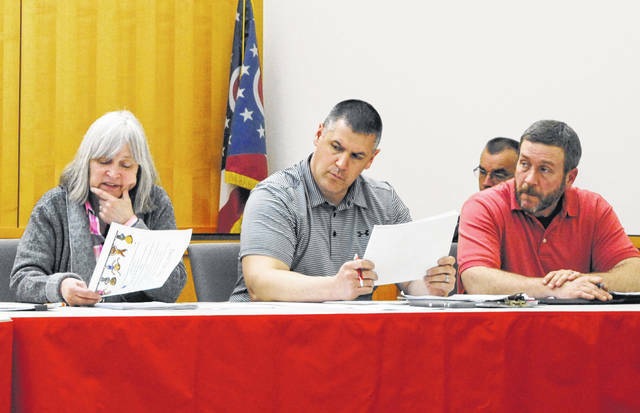 Hastings also said as part of a newly signed agreement with the Paint Creek Joint EMS/Fire District, the city will have ownership of the old firehouse on Governor Trimble Place uptown. The mayor requested that a committee discuss possible uses for the building, suggesting that the committee meet at that location. Harsha placed the matter in the Property Maintenance and Restoration Committee, chaired by Councilwoman Ann Morris. Hastings also welcomed Scott Faulkner, who has opened a new State Farm office on West Main Street. In the Safety and Service Director’s report, Mel McKenzie said daytime ODOT paving on U.S. Route 50 will begin April 15. McKenzie said the road will be down to one lane in the areas where crews are working. “Please be aware that there may be traffic delays,” McKenzie said. SR 138/Greenfield Pike will also be resurfaced from the corporation limits to High Street, McKenzie said. That will also be a daytime project, he added. McKenzie also requested a committee discuss the deposit renters have to make before receiving water and sewer service. Harsha placed that matter in the Utilities Committee. The safety and service director also commended Hillsboro High School’s student council for offering to donate its time to improvement projects at Harmony Lake and Liberty Park, including possible sunflower and wildflower fields, dog agility structures and new trees. Utilities Committee Chairman Brandon Leeth said his committee is continuing to discuss funding for a Stormwater Utility, a surcharge designed to fund Hillsboro’s failing storm sewer system. Leeth added that due to stormwater running into the sanitary sewer, the city’s treatment plant is running at capacity. Harsha reported that the Finance Committee, of which he is chairman, met twice on April 4, its second meeting being a joint gathering with the Civil Service/Employee Relations Committee. Harsha said the committee first discussed newly implemented building department fees, which “closely resemble” nearby Wilmington’s fees and reflect a roughly 10 percent reduction across the board. At the second meeting, the committees tabled discussion of elected officials’ salaries due to the city budget being “tight right now,” Harsha said. The committees also reviewed compensation of non-union city employees, according to Harsha. In the Hillsboro Planning Commission report, Hastings said the commission met March 18 to grant a conditional use permit and discuss the Imagine Hillsboro comprehensive plan currently in the works. The mayor said there will be public sessions beginning at 11 a.m. April 15 at The Times-Gazette Community Room to hear input. Food will be provided. Council also approved an ordinance to grant a temporary prescriptive easement along an alleyway.